If a nation who had killed or injured over 1.5 million civilians just 60 years ago and then subsequently continues to carry out military exercises on your doorstep, you’d be nervous and on edge to say the least. Well this is the situation North Korea finds itself in. Much of the worlds media has focused on the tyranny of North Korea and the Kim family dynasty that has ruled North Korea since its inception. And while it is true that The Democratic Peoples Republic of Korea does not belong to the people, is not a republic and is not democratic (1 out of 4 is true!) North Korea is behaving as anyone would and should expect given the circumstances. In 1945 Korea was split in two without any consultation of the Korean people. The Soviets took the North and the Americans took the South in order to set up Korean governments following the end of Japanese colonial rule. Pretty much everyone will say North Korea and while this is true it does leave out an important piece of information. The North attacked the South because after calling for unity elections South Korea arrested North Korean diplomats, this is why the war started. The war led to 2 million fatalities of the Northern alliance and 1 million from the Southern alliance. 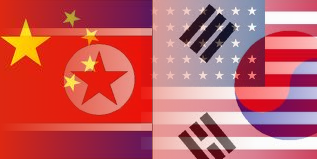 Both sides of Korea have every right to be on edge but probably more so for the North, losing over two million people and most of the world against you, the biggest military constantly carrying out military drills by your borders, economic sanctions as tight as they can be with the only bigger step being a military attack. The US is pretty much justifying the rhetoric coming from the North and the development of their long range missiles and nuclear weapons. If the US backed down, there would be no justification for North Korea and its dictatorship to behave the way it is, meaning any retaliation to a North Korean military action would be wholly legitimate and accepted by all sane people of the world. A fine example is today’s news where the US is flying nuclear capable B-52s around South Korea as part of joint military exercises amid the already extremely high tensions on the peninsula. It is like the US is deliberately trying to provoke a reaction from the North in a childish and pathetic attempt to to legitimise an invasion. No to North Korean dictatorship and no to the US in North Korea. It is always the people who pay the ultimate price! This entry was posted in Anti-War, North Korea, South Korea, USA and tagged B-52, Democratic Peoples Republic of Korea, dictatorship, DPRK, korean peninsula, Korean war, military exercises, North Korea, politics, ROK, South Korea, tyranny, US on 19/03/2013 by Leon J Williams.